(Door sales only), music from 9pm. Hawaiian Shirts (and/or santa hats) welcome. The beach party is back! After the roaring success of the Mid-winter Beach Party back in June, we thought 'heck why not make it a seasonal thing?' 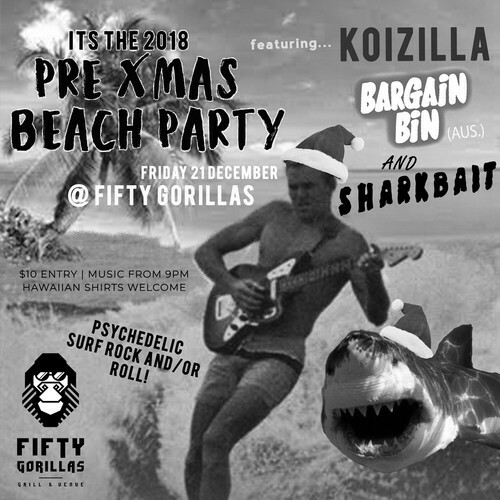 Only this time we've upped the ante with not just one... but two of Dunedin's finest Psychedelic Surf bands Sharkbait and Koizilla, as well as an international one man Punk act Bargain Bin all the way from Melbourne, Australia! Sharkbait exploded onto the local music scene this year with their wildly energetic live shows, including outlandish stage props, choreography and actual 60s Go-Go dancers! Their quirky mix of Traditional 60s Surf and Doo-Wop styles combined with heavy psychedelic punk and Rockabilly will have your head spinning and toes-a-tapping simultaneously! Koizilla are a powerhouse of the Dunedin music scene at the moment, alternating effortlessly between fuzz-fried freakouts, psychedelic slow jams, and ferocious sonic explosions. They've toured all over NZ and have already released 3 EPs and a full length Album in just 2 years! Check out this live performance on Radio One. Wow what a lineup! And for just a measly $10 entry you really are getting a bargain I tell you what. But wait... there's more! Don a Hawaiian shirt or a Santa hat (why not both?) to the show and be in to win a special mystery prize! Need I say more?